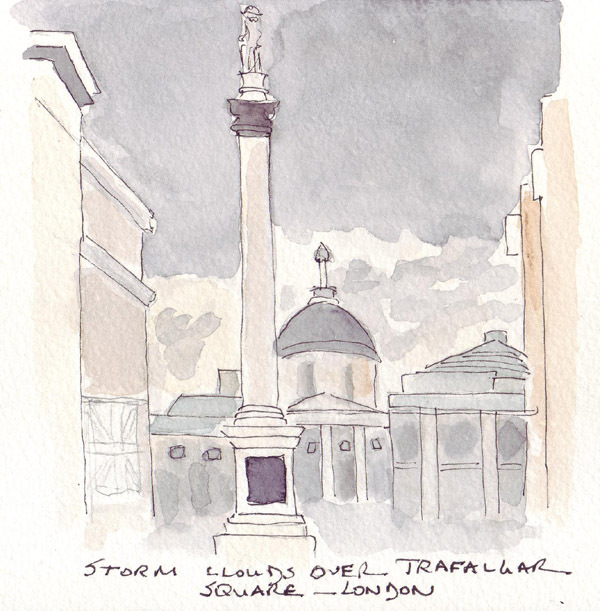 We were riding up WhiteHall in the front seat on the top deck of a #11 bus when I took this photo of storm clouds gathered over Trafalgar Square and the National Gallery. During most of our recent visit, black clouds alternated with sunshine and there were periodic drenching rains. This was a really difficult challenge for me. I clearly need more practice seeing, sketching, and painting textures. 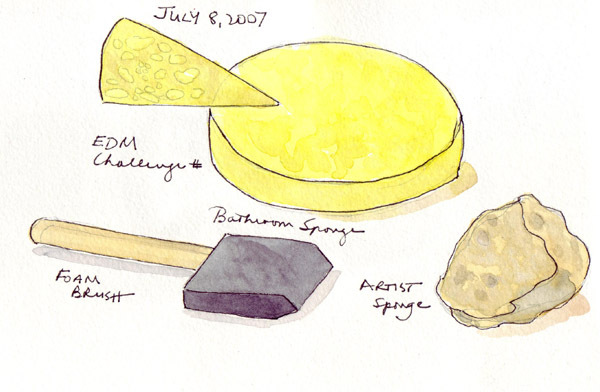 The pie-shaped section is my attempt to paint a close-up of the bathroom sponge surface. Out of frustration I added a foam brush - a quasi-sponge! 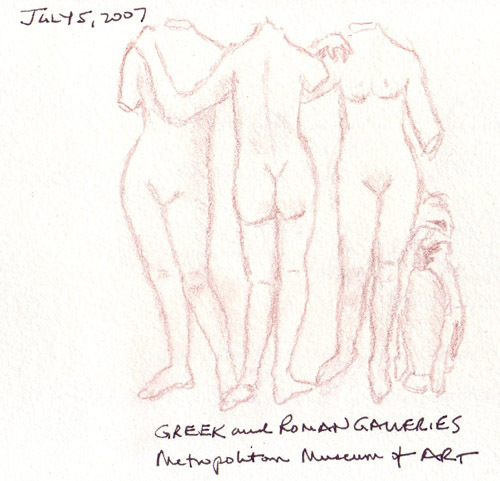 Casey, Sandy, and I met this morning at 10 and spent the day sketching together in Central Park and the Metropolitan Museum of Art. It is so much fun to meet other EDM members - who you feel like you know from reading their blogs, enjoying their art, and exchanging comments. 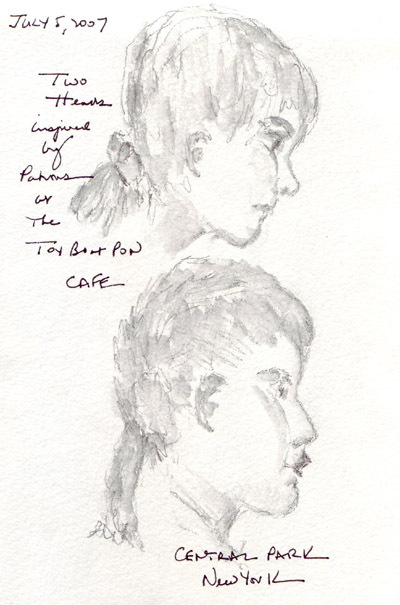 Sandy and I would like to sketch faster and looser like Casey - so we watched her carefully! 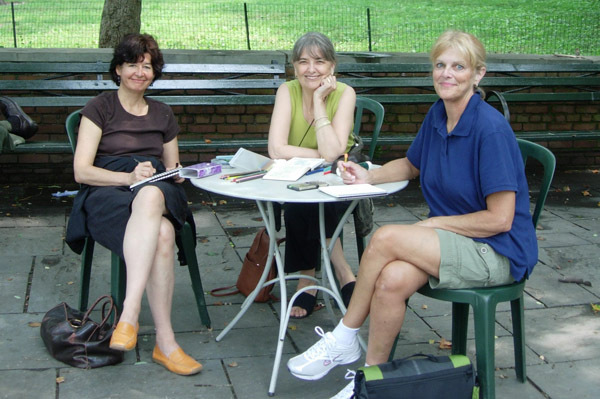 The 3 of us will upload our individual journal pages as they are completed - I'm not sure that mine are too different from my normal style as much as I tried. 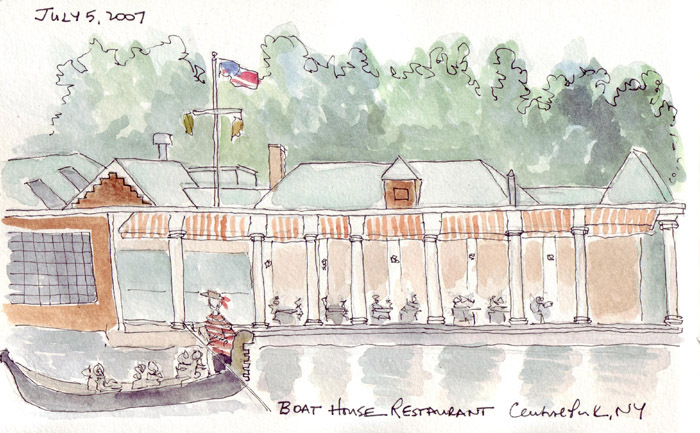 Here are two photos: We started at the Toy Boat Pond, moved to Bethesda Fountain, then had lunch at the Central Park Boathouse. 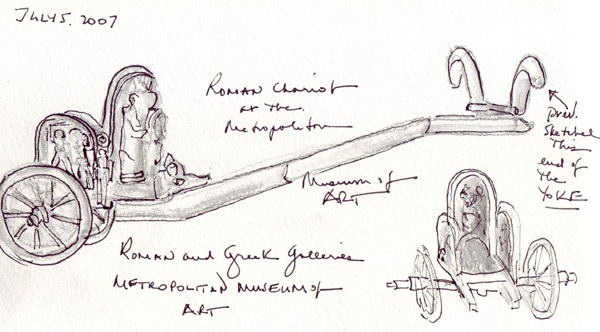 We ended the day on the Sculpture Garden Roof and in the Greek and Roman Galleries at the Metropolitan Museum of Art. 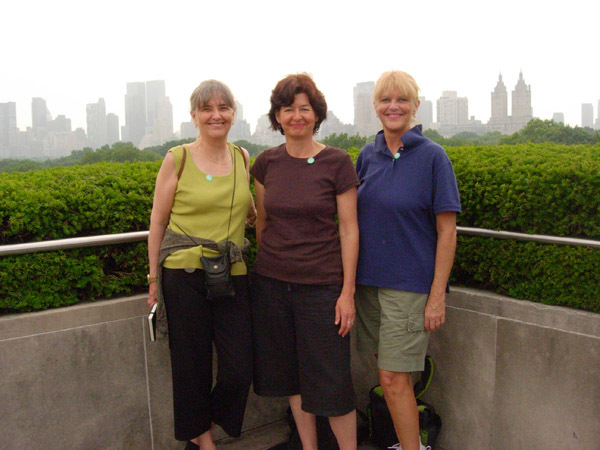 Left to Right: Casey, Shirley, Sandy. A view of The City from a riverside cafe at Hay's Galleria on the Southbank of the Thames. We are nearing the end of a wonderful year during which we really got to know London so much better. It was a unique opportunity for us - being able to live in a terrace and shop in the local markets and stores in Chelsea. We were also, ever so briefly, part of a family that was working and going to school, going to doctor's visits, having a baby, and taking soccer and swimming lessons. But we also had time to ourselves to explore the streets, museums, theaters, famous national buildings, and restaurants. Since July 2006 we have visited 6 times - each time for 2 weeks except for a 3 week visit over Christmas when our grandson decided to arrive 6 weeks early. Tomorrow we return to New York, leaving a house that feels sadly empty since our daughter and her family moved back to New York several days ago. I'm surprised and delighted that I was able to complete this art project - finishing sketchbook #3 on this trip. Maintaining a daily sketchbook is new for me and my goal always was to develop enough skills to have many photos and a travel sketchbook from our travels. For London I used spiral Cachet Linen Watercolor Journals (9 " x 7" cold press paper) and was able to use both sides of every page without any problem. 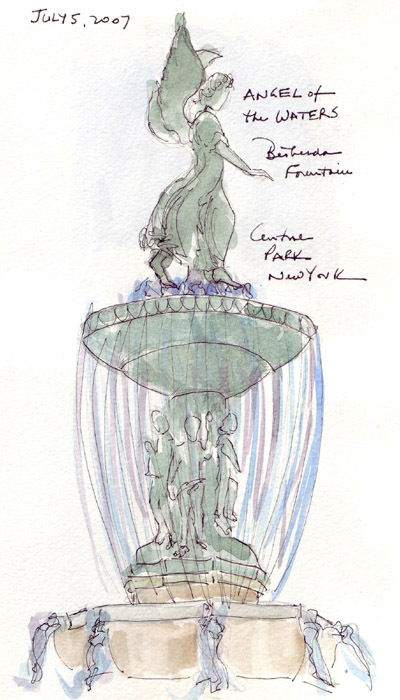 That means that I have approximately 150 pages of sketches - and all except a few have watercolor washes. I also will have a Liberty of London scrap quilt which I worked on while here to remember this year. 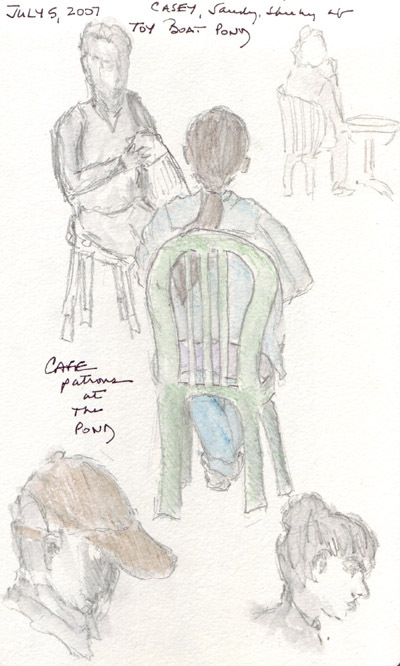 I am naturally drawn to all sketchbooks using pen with watercolor and I used Pigma micron pens in the beginning and Zig Millenium pens more recently. I have a small Daler Rowney travel watercolor set for days out and a palette with 12 W-N watercolor paints dried in the wells for home. I carry only my sketchbook, pen case, Niji waterbrushes, and paints in a small backpack when I leave the house. 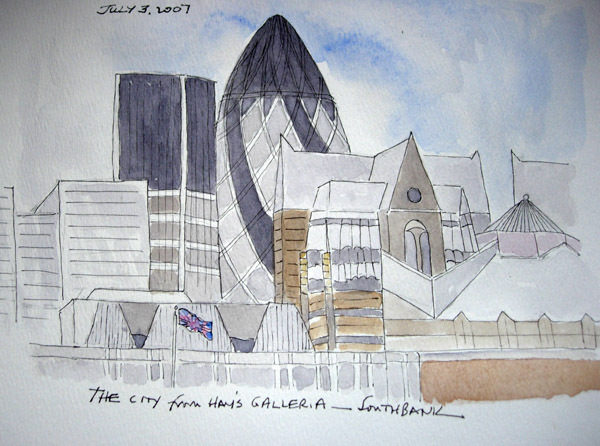 Many of the sketchbook pages were uploaded and can be revisited by clicking through the London tag on the right side. A combination of a real antique guard uniform and the life-size Bear that sits in front of Daisy and Tom's toy store on King's Road in Chelsea. When visiting the Antique Military Uniform dealer in Antiquarius (131/141 King's Road), I learned that you can tell which guard division wore the uniform by the placement of the buttons. 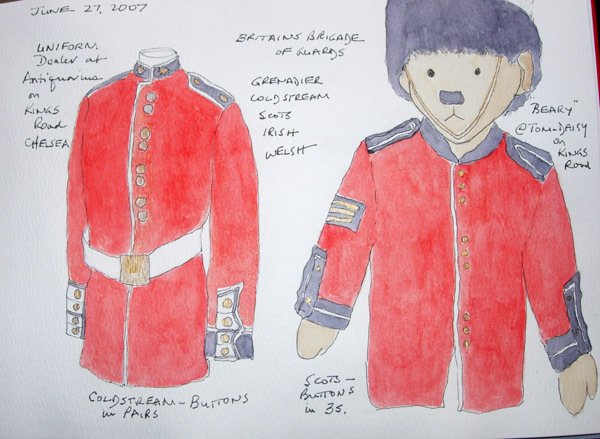 Here on the left is a coat from the Coldstream guards because the buttons are in groups of 2. The Bear is dressed in the Scotch jacket because the buttons are in groups of 3. Inspired by an ink painting in the China Gallery at the Victoria and Albert Museum. An exercise in perspective: this is the modern stairway in the central area at the British Library on Euston Road. I'm not sure that it is possible to understand it unless you know the structure. This was my second visit to the manuscript reading room over the past year to transcribe a letter from Col. Henry Bouquet to the British General George Gage. My Gr-Gr-Gr-Gr-grandmother Christina Wampler was kidnapped in 1757 by the Delaware Indians as child from the Wampler farm in Lebanon Township Pennsylvania. Col. Bouquet was then sent to the Ohio Territory to arrange a prisoner release with the Indians and in 1764 sent a letter to General Gage describing the negotiations and listing the prisoners who were delivered to Fort Pitt by the Indians (now Pittsburgh).